NextBullets, blood, sweat and courage: All in a days work for war cameraman Damien Parer. 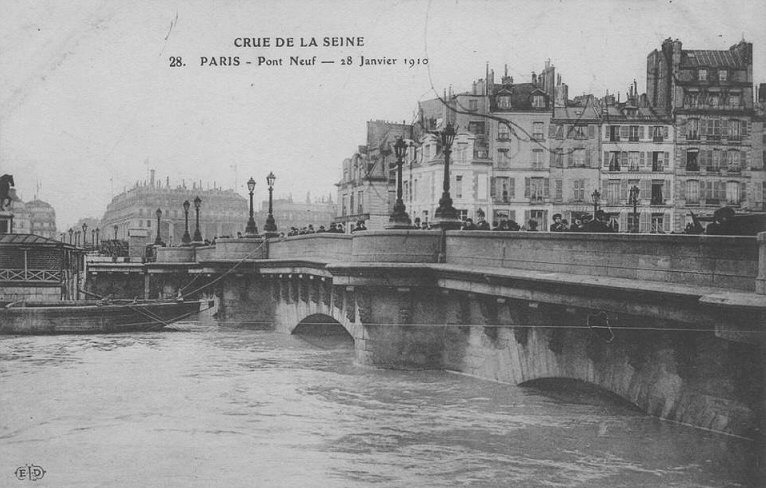 In the last week of January 1910, the Seine River flooded the city of Paris and its surrounding neighborhoods causing an estimated 400 million francs worth of damage. Fortunately, no deaths were recorded, but Parisians suffered the indignity of being stranded in the homes and or in the streets of Paris. Emergency services and the military were forced to make headway through the saturated streets in boats to rescue people from second-storey windows and to distribute relief aid. At the conclusion of the emergency crisis that gripped the city, many Parisians were left to wonder what happened? In the weeks leading to the flood, heavy winter rainfall across northern France filled the Seine’s tributaries. When the deluge of water reached Paris on the 21st January, authorities became increasingly alarmed at the slowly rising Seine. Winter floods were a common occurrence in Paris, but when the Seine River began to rise a lot swifter than usual, panic gripped the city. Over the course of the following week, the Seine rose to an elevated height of 8.62 metres. In the city itself, the water threatened to burst its banks, but was stopped with hasty levees constructed by city workmen. Though outside the city centre, the river eventually did rise above the banks, flooding both the east and west of the city’s suburbs. At the height of the Great Flood, the Seine River reached 8.62 metres. The following image shows Le Pont Neuf (bridge) being threatened by the rising waters. 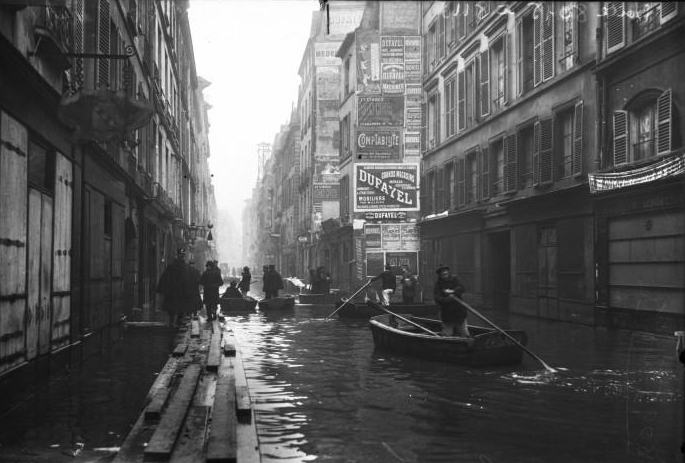 The street of the Rue de Seine under water. It is quite reminiscent of being in Venice on a gondola. In the aftermath, the flood water wormed one’s way into buildings and streets, tunnels, sewers, drains and many of Paris train stations including the Metro. The unfortunate and homeless were forced to gather in provisional shelters in many churches, schools and government buildings. Those that could get around were forced to walk along makeshift bridges and or paddle down streets in boats, something reminiscent of being in Venice. It took some 35 days before the water had completely disappeared. Whether Parisians have learnt from the catastrophe of 1910 is questionable today. Since the 1910 Great Flood, the Seine River has threatened to completely flood Paris again in the years of 1924,1955,1982 and 2000. In 2002, the French government prepared a report stating that in a worst-case scenario, another Seine flood to levels not seen since 1910, would leave hundreds of thousands of Parisians without telephone service, electricity and gas. With or without a report, some experts believe that there is a real concern the city might not actually be prepared adequately for the possibility of another once in a century flood. With fears of climate change and continual wild swings in seasonal weather, not only in France, but across Europe, there is real reason to fear it just might happen again. The header image shows makeshift walkways that were created to mobilise Parisians during the flood. Somewhere I have a small booklet with illustrations of the 1910 flood….all I have to do is to remember where it is. Here is a terrific article from Robert Horvat’s history blog on the great, and little-remembered today, flood catastrophe that struck Paris just before the First World War. I did not know any of this, so it’s always fun to find a blog article that teaches you something. And the old photos are terrific! Great job! great article. Does anyone remember what month in 1982 the flooding occurred? I was a student at Sciences Po from septembre 1981 to juin 1982, so I’m assuming it was later than June 1982 since I have no recollection of this. I lived not far from la gare Montparnasse, and walked to la rue St. Guillaume to my classes.